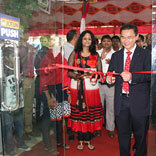 Opens concept 'Multicolour' retail outlet in Mumbai. Jotun launched its first exclusive Concept 'Multicolor' retail store at Powai, Mumbai. This exclusive Jotun brand store, also known as Jotun Multicolor outlets, is spread across 350 sq. ft of prime retail space and will provide Jotun Interior, Exterior and Textured range of Jotun paint products. Jotun ‘Multicolor outlet’ has panels that display the different textures and colours offered by the group, and exhibits decorative paints. These outlets also have the facility that enables the consumer to choose their desired colour, and then receive the desired amount of the same, on the spot. This is extremely viable for those who require small amounts of a particular shade. This is the first exclusive store in Mumbai that Jotun has set up and has plans to add several more in the future. The store has been set up through a franchisee agreement and will offer customers a wide range of products and services to choose from. It will be managed by specially trained sales teams, who will advise customers as to what color shades would suit their home. In addition, customers will also be able to procure customised exterior / interior colour shades, wall texture advice and get a feel of how different color shades will look in their homes on specialized color kiosks.